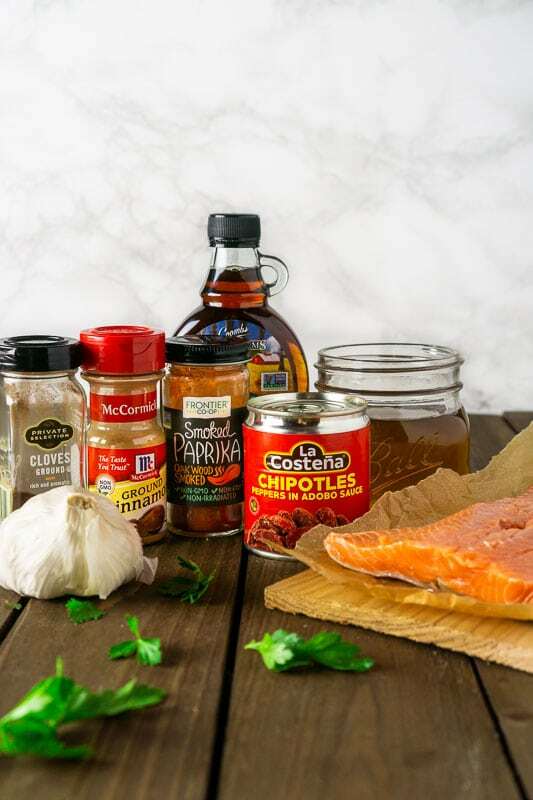 In just a few minutes, you can whip up this sweet and spicy marinade to make this delicious maple-chipotle grilled salmon. Cooked on the grill and bursting with fall flavors, this salmon recipe is the perfect transition from summer to fall. You’ll love this easy, quick and tasty grilled salmon! As much as I love the fall, I always struggle to let go of summer. Sure, fall marks the return of pumpkin spice everything, cozy sweaters and beautiful foliage, and those all make me feel warm and fuzzy inside. That said, every year I need a little help saying goodbye to summer and embracing the fall. Nothing makes me happier than spending a warm evening on the patio with the grill fired up and a drink in hand. By keeping the grilling spirit alive and reintroducing fall flavors, I can slowly learn to let go. 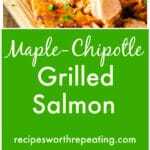 Why This Maple-Chipotle Grilled Salmon? Besides its transitional nature, this grilled salmon recipe offers a few other selling points. Is this recipe easy? Check. Is it quick to make? Check. Delicious? You bet! And you know what else it is? Completely customizable to your taste preferences or mood. The recipe below is my go-to base for this marinade, and it’s great as written. But some people may want more heat from the chipotle while others prefer to tame the heat with a touch more sweetness. You can also try a tangier version with a little more apple cider vinegar or even add orange peel for a citrusy kick. Feel free to stick to the tried-and-true recipe or get creative with your own spin. While we use this maple-chipotle marinade on salmon in this recipe, it’s also delicious on ribs, pork chops and grilled chicken. With just one easy marinade, you can make so many different recipes. Now let’s review the star players. This maple-chipotle grilled salmon only calls for a handful of ingredients — most of which you probably already have in your pantry. The simple and easy theme continues. Let’s start cooking! You can either grill the salmon on foil with cooking spray or a cedar plank. Both methods work well, but if you use a cedar plank, soak it in water at least three hours before grilling. To work against physics, you’ll want to put something heavy on the plank to keep it submerged. I find a glass filled with water works well. About 30 minutes before you plan to grill, take the salmon out of the refrigerator to allow it to come up in temperature for more even cooking. You can also go ahead and whip up the marinade. Dice the chipotle pepper and then simply stir together the chipotle pepper with some adobo sauce, maple syrup, apple cider vinegar, cinnamon, cloves, garlic and salt. Brush the salmon liberally with the marinade, and you’re ready to grill. Heat the grill on the high setting until it’s nice and hot. Turn the heat down to medium, place the salmon on the grill and close the lid. Make sure you turn down the heat. First of all, you don’t want to overcook the salmon. Second, if you’re using a cedar plank, the high flames could light up the wood even with the soaking. After about 10-15 minutes, your salmon should be flaky and ready to enjoy. Before serving, I like to add a little chopped fresh parsley to give the salmon a nice color pop and fork the salmon directly off the skin for a family-style presentation. Along with this maple-chipotle salmon, here are a few recipes I especially love right now. Ahi nachos with wasabi crema: For a fun, fancy twist on nachos, this is perfect for football season. Spicy herbed avocado dip: Another great option for game day. S’mores ice cream: S’mores and ice cream join forces to make one delicious dessert. Just a quick note, if you’re gluten free make sure you read the labels on your adobo sauce to ensure no wheat is listed. Some brands do include wheat while some don’t! Did you find this blog post and step-by-step instructions helpful? I hope you love this maple-chipotle salmon as much as I do. If you try it, you’re welcome to leave a comment and rating below. I love hearing from you! You can also sign up for my newsletter on my website here and FOLLOW ME on FACEBOOK, TWITTER, INSTAGRAM and PINTEREST to see more delicious food I’m creating! In just a few minutes, you can whip up this sweet and spicy marinade to make this delicious maple-chipotle grilled salmon. Cooked on the grill and bursting with fall flavors, this salmon recipe is the perfect transition from summer to fall. You'll love this easy, quick and tasty grilled salmon! If using a cedar plank to grill, submerge in a container at least three hours before cooking. Fill a glass with water and place it on top of the plank to keep it submerged. About 30 minutes before you plan to grill, take the salmon out of the refrigerator. While the salmon comes to temperature, stir together the chipotle pepper, garlic clove, pure maple syrup, adobo sauce, apple cider vinegar, cinnamon, cloves, smoked paprika and salt. Liberally brush the marinade onto the salmon. Place on the cedar plank or foil with cooking spray. Heat the grill on high. Once it's hot, drop the temperature to medium. Place the salmon on the grill, close the lid and cook for about 12-15 or until the internal temperature is to your liking. Remove from grill. Garnish with parsley. Serve by directly scooping the salmon meat from the skin. NOTE - If you are gluten free, read the labels on your adobo sauce to ensure no wheat is listed. NOTE: You will find affiliate links on this page. Amanda runs Burrata and Bubbles, a food blog dedicated to pairing her favorite recipes with libations. She lives in Denver and loves entertaining and throwing parties. When Amanda isn't playing hostess, she's probably obsessing over her dog or exploring new breweries. This recipe looks so delicious and flavorful. Great pics too. Will soon try your recipe.YUM! This looks soooo good — I love the sweet-spicy combination. Chipotles in adobo sauce makes everything better! I love this recipe! Chipotle peppers and maple syrup are such a delicious flavor combination! I can’t wait to try it! I am drooling over this salmon dish. It sounds simply amazing!